Not just for Christmas time, I’m a firm believer that wreaths work well throughout the year and can be adapted beautifully for each season, especially during Autumn when the colours are just too good to pass up. The hedgerows are bursting with the most amazing burnt orange hues and I bet you don’t have to go far to find enough foliage to make something beautiful! 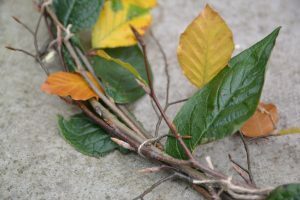 All you need for this wreath D.I.Y is some string, scissors & whatever beautiful Autumn foliage you can get your hands on! Step 1. 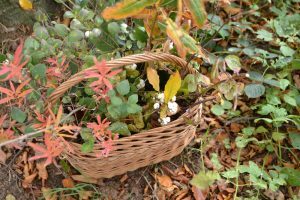 Firstly, grab a basket and get foraging! 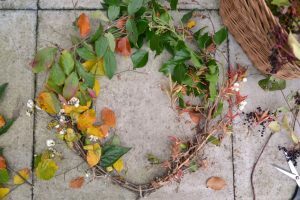 You don’t need to live in the countryside to be able to do this, a park, woodland or walk round your neighbourhood probably has plenty of material to supply your wreath making if you really look for it. 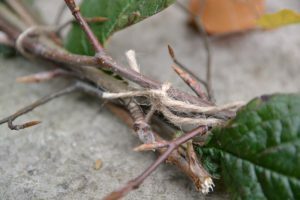 You will need a few branches with good twigs on them for the base, some greenery and some accent finishing details like some berries or flowers. Step 2. 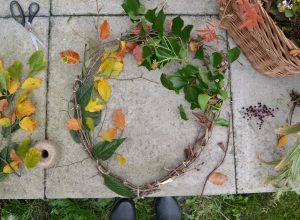 Set yourself up a wreath making station, with all your tools and foliage laid out on a flat surface. I usually do mines outside so I can make as much mess as I like! Start making your base hoop by tying a few of the branches together nice and tightly with the string. Step 3. Once you have a few pieces in a row large enough to make the wreath size you desire, shape the branches into a circle and secure together with sting in a few places. 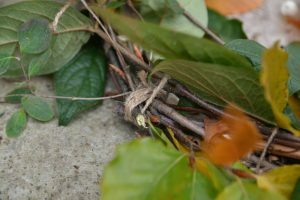 Tie in any loose pieces of foliage until you have a sturdy hoop shape. Step 4. 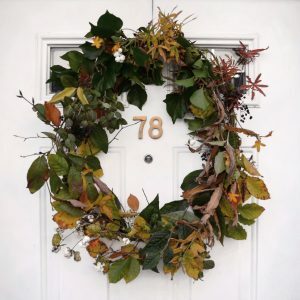 Add your next layer with the same technique, following the shape of the wreath until the branches are evenly covered. Step 5. Continue layering on top with more pieces until you get the effect you are looking for. 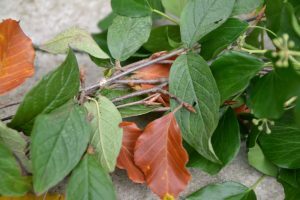 Try to hide your string as much as possible by tying it in places disguised with leaves. 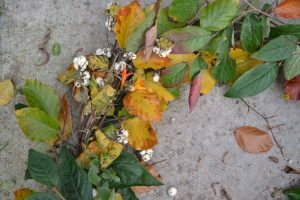 Finish with the accent pieces of berries and flowers as you like, tucking them in and securing them into place with string or wire. Step 6. Cut away any extra pieces of string and it’s ready to be hung in pride of place on your front door! What better craft to celebrate the beauty of Autumn!